This episode Will & Mike slip into their cassocks, whip out their prayerbooks and head down to Southminster for ‘An Episode of Cathedral History’ by M.R. James. – When is a vampire not a vampire? – Do Lamia have hairy legs? – What length of skirt do Mike and Will wear? Big thanks go out to Roger Burton West who provided the readings, and Alisdair Wood for the awesome custom illustration on the right! This story refers twice to characters in Dickens’s famously unfinished novel ‘The Mystery of Edwin Drood’. There are various suggestions in the story that M.R. James may have had Rochester Cathedral in mind while writing this story. This website illustrated quite how much the Isaiah quote which appears in this story differs from one translation to another! The latin quotes in this story make reference to two creatures from Greek Mythology, the Lamia and the Satyr. Apparently the plot of this story was used as part of a hoax played on Fate magazine in 1977! This essay examines ‘An Episode of Cathedral History’ and discusses the mythical creatures mentioned in the story. This story refers to ‘Simeon’s Lot’, a reference to the English evangelical preacher Charles Simeon, who James’s own father was a follower of. Patrick and Fred are two American academics who are conducting research into the medaevalist and antiquarian background of M.R. James’s stories. The excellent footnotes on this story in the ‘A Pleasing Terror’ ebook were of great help to us when researching this story. The unfinished James tale dubbed by Rosemary Pardie ‘Speaker Lenthall’s Tomb’ bears some striking similarities to ‘An Episode of Cathedral History’. It is an understatement to say that M.R. James was not a big fan of the architectural changes undertaken in British churches in the name of the gothic revival during the 18th and 19th century. The feeling I got from at least part of Worby’s parents’ deception is that they don’t themselves want to think about what might be going on out there… until they have to. But I agree that in many respects this is a bit of a weak story. James has matured in the craft of writing, but I think he backs off a bit too far from actually telling the reader what’s going on. Still, that’s my modern sensibility, wanting things to make sense. Hi Will, hi Mike! So I noticed a new episode was up on iTunes, came to the website to check out the show notes… and imagine my surprise to see the name of my old faculty advisor at Denison, Dr. Porcheddu! I knew he was an expert on Anglo-Saxon literature, but I had no idea he had an interest in M. R. James — never came up, I guess. Anyway, he’s a heck of a nice guy, so if you ever wanted to try to interview him for the show, I’m sure he’d do whatever he could to accommodate you. Great podcast, as usual. Nicely squeezed out, as it were, in time for Hallowe’en. Regarding the “random” deaths and the whereabouts of the demon after her/its release, I think there is a reasonable explanation. Let us assume that the demon per se is trapped in the tomb. Are we sure that the demon regularly escapes from the tomb to bother the neighbourhood? I think not. Something emerges and flits about, true, and something spreads illness (very selectively), but is it the demon? Perhaps not. It could be an emissary, an aspect of the demon, or an avatar. Note who falls ill after the malevolent nocturnal visitations: Dr Ayloff, the widow, and various local children. As James tells us: “Gradually there formulated itself a suspicion — which grew into a conviction — that the alterations in the Cathedral had something to say in the matter.” Here, in my view, is the key to the matter. Dr Ayloff was opposed to the alterations to the cathedral – he was struck down. The widow was married to a verger – presumably he (and perhaps by extension his wife) would also be conservative regarding the alterations. The children are more dubious – but then children die (or did die in the 18? ?s), and there might have been a local tendency to blame their losses on some supernatural juju. In short, look at it from the demon’s point of view. She/it WANTS to be free – and why not? Why was she/it entombed in the first place? Was it just? Was it accidental? How malevolent (truly) is she/it? Is she/it in fact justified in her/its persecution of those whom, from the confines of her gaol, she/it sees as her imprisoners? Now, along comes the new Dean, and has a plan not only to refit the church, but effectively to release the demon, unwittingly of course. She/it can hear (or at least knows)this, somehow. So the new Dean is, to her/it, a “good guy”. Bring on the refurbishment, she/it says. Please! Let me out! I’ve been here since God knows when – was she/it brought back during the Crusades (there being a strong hint of the Middle East about her/its origins), or perhaps even earlier? Is she/it some pre-Christian survival, entombed not once by the physical stone box, but also again by the Christian edifice around it? So, perhaps, she/it sends out her avatar to bother the district, to hasten her own release, to “kill off” opposition, as she/it perceives it, in some primitive way (“with intelligence just less than human” – vide Canon Alberic’s Scrapbook). And so to the climactic scene. Why does the demon flee, seen only by Worby Senior, never to worry the district again? As for why only Worby sees it, I cannot say. Is he another of the forces of conservatism, who has so far avoided the wrath of the creature, but is visited by the last sighting as payment for his unconscious cruelty as an arms-length gaoler? Or is it just a device – after all, someone has to see the thing, so why not Worby, father of our telescopic protagonist/narrator. As for the demon’s escape, it is just that, surely – a final physical release from a sepulchre of the ages, an exhalation of relief as our “screech owl” dissipates back into the World, back to her/its elemental home. It’s rare that a James story allows for an interpretation of the demon as good guy, or even as a sympathetic character (“Martin’s Close” is one exception), but this is perhaps such an instance. “Ibi cubavit lamia” indeed – but now she/it is gone, released from her prison, but with no more business of malevolence with the people of Southminster. Cracking good story, cracking good podcast. Keep up the good work. Great explanation Simon – and very close to some of Patrick and Fred’s analysis. They felt the ‘demon’ had been trapped since the Reformation – its release marks the beginning of reforms to the Church begun in the 19th century. The crying’s lack of an echo could be the aural version of the vampire’s lack of a reflection. That IS a good idea! Apart from light and sound effects in general being part of the construction of the story (remember Worby’s comment to Lake that the nighttime visit “adds to the size and height” of Southminster, plus the falling wood at the climax, the odd whistle into the tomb, and so on), James’s comments on _Edwin Drood_ included a reading of the frontispiece of the serial very much in this vein (haha): he was convinced that Drood couldn’t be dead in part because he casts a shadow on the wall behind him. So some degree of physical law seems to have been on his mind…. Yes, the mirror thing is directly from BS; Dracula breaks Harker’s shaving mirror when his lack of reflection becomes apparent. Stoker was borrowing that one from Slavic traditions – Greek vampires had both reflections and shadows. It was extremely common to cover mirrors in Britain, Ireland, and across large parts of Europe when a house was in mourning, so as to avoid trapping the spirit in the house and preventing it going to Heaven. In the same… vein, it was common in some areas to put bowls of water by doors, windows and hearth to prevent spirits (including vampires) from entering a home. There is something very deeply ingrained about the magical properties of reflective surfaces, probably because good mirrors and highly polished surfaces were rare and expensive until recently. This was one of the stories that got me introduced to M. R. along with “Count Magnus”, “The Diary of Mr Poynter” & “Casting the Runes”. At the time I didn’t know anything about M. R., & I bought the anthology (“The Best Ghost Stories”) to get Sheridan Le Fanu’s Carmilla, and the stories by H. P. Lovecraft & Edgar Allan Poe. The anthology also introduced me to Guy de Maupassant & Algernon Blackwood. I absolutely adore the whole scene the kids semi-witness from above. The elder Worby’s subsequent reticence rings very true; I compare to my own father’s lack of stories about his childhood under Nazi occupation, and wonder if James isn’t drawing on reactions he’s seen to the un-fun horrors of the war. I don’t argue against the interpretation Simon offers above, but I will suggest a counter-proposal; having been freed of the trap which a previous wiser age had pressed it into, the thing now has a whole world to spread misery about in– why hang about a quiet corner of a damp island? It’s a bit simplistic, but if the demonic being flits out at night and if it drains the life through a mysterious illness…then it’s vampiric. It may not be the “classic” vampire, but as a life-draining entity, it fits the pattern. I wondered where the lads had had got the ‘flying’ idea from… I take ‘flit’ in this context to mean moving swiftly but sporadically, not flying through the air. But what was that bit on the list about transforming into a bird? The vampire pro/con list made me I wonder. I doubt whether the supernatural creatures of James’ time were as codified as they are now. I mean that in popular culture now, if a monster has this list of traits we know it is a vampire; if it has these other traits it is a ghost, or a demon, or whatever. But our ideas are heavily influenced by the shorthand of a century of film-making. Of course James had read ‘Carmilla’ and ‘Dracula’, but would he, and the others of his time, automatically have put them into a mental box marked ‘vampire stories’ and thought it a bit odd that Carmilla could walk around in the daylight, or that Dracula entered houses he hadn’t been invited into? I remember seeing Alien for the first time, before the ‘alien’ rules were common knowledge. We didn’t know WHAT was gong on, and it was VERY SCARY! I recommend a brilliant book on the folkloric vampire: ‘Vampires, Burial, and Death’ by Paul Barber, and also Marcus Sedgwick’s ‘My Swordhand is Singing’. The typical vampire of folk lore seems to me to have more in common with the modern zombie film than with the average Rician (is that a thing? can I say that?) bloodsucker. What we think of as “classic” vampire stories are a product of the Victorian era, and the inability to go out in sunshine wasn’t set in stone. During the famous vampire outbreaks in Europe (Prussia, Greece, Serbia), vampires often stumbled their way right through town in broad daylight, drawn to prey on their families. The traditions we shove under the umbrella term “vampire” have a lot of overlap with ghouls, Hollywood-style zombies, and other revenants. ±Great podcast as ever chaps. This happens to be my favourite MR James work, mainly it has to be said for the creepy atmosphere it conjured up the first time I read it aged around 13. I’m surprised the BBC didn’t dramatise this when they were knocking out the adaptations, this is ripe for the screen! I must disagree on the assertion that Isaiah is a “doomy” book. It really is, as observed in the podcast, a book on judgement, but also has some of the most beautiful passages on restoration and hope. I believe, though this is from memory, that those hopeful passages are the bulk of Jesus Christ’s biblical quotations! Anyhow, this is one of my favorite James’ stories and both your reader and the analysis are fine. Added to my enjoyment of the story the next time I read it. I have read that in rural Greece there are churches which were formerly temples dedicated to pagan gods, and where some of the old iconography is still in evidence. Given the resemblance between Pan and Satan, it could be that the inhabitant of the tomb is just such a pagan god. Like Count Magnus, it has to get someone to summon it – hence the boy’s inexplicable impulse to whistle into the tomb, just like Mr Wraxall’s urge to address Count Magnus. As for “Lamia” – it looks as if the word is a general term for something evil – this could be why it has been translated in so many ways. Not having the works of Keats to hand, I can’t check his poem of the same name; but this might be worth doing. “Ibi cubavit Lamia” means (as far as I know) “Here lay the Lamia” -ie perfect tense, because when the inscription was installed the Lamia had gone. Irrelevant point: it’s strange how many of MRJ’s monsters resemble the Morlocks in “The Time Machine”. I have my own theory as to the supernatural taxonomy of the monster in “An Episode of Cathedral History”. As we learned from Count Magnus and The Rose Garden, M. R. James had a passing familiarity with folklore of the Norse region. I suggest, then, that the “lamia” of this story is a drekavac. 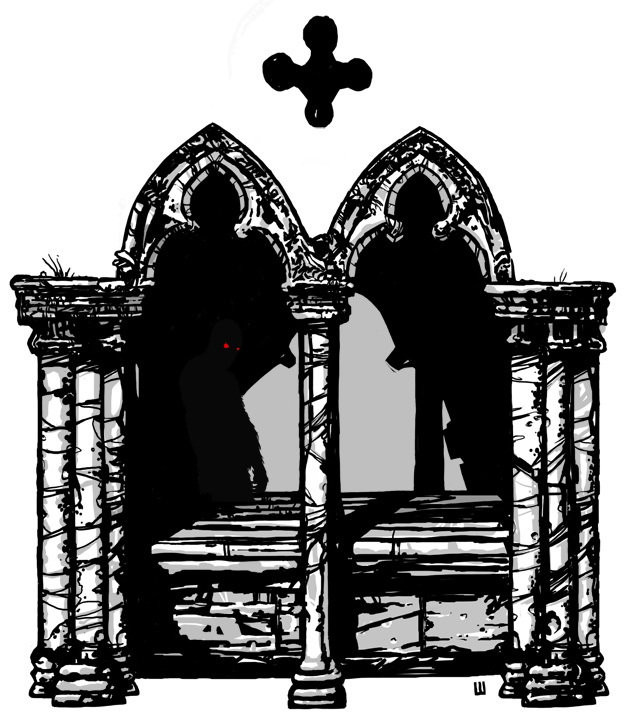 The drekavac is the undead soul of an unbaptized child. Its appearance and description varies, some simply as a child dressed in white, but more commonly it is a great hairy beast or a like a child but horribly distorted with long thin limbs and bulbous head and eyes. It’s name comes from “to cry” or “crying thing”, because unexplained eerie howls in the night were attributed to drekavacs. One explanation given for this was that its fur was so long and tangled it was constantly stepping on its own mane and thus causing itself agony. Drekavacs apparently are associated with death omens, like to dwell in dark tunnels or caves, and fear sunlight, dogs, and sometimes their parents. Maybe if the kid kept his dog out it would have gone away? Listening again to this podcast, I was struck by your comments on the communal nature of the story, and the ritualistic nature of the goings-on in the church. It might be worth looking at the Wikipedia entry on “Quem quaeritis?” – yet another possible source of inspiration for MRJ. I’ve always liked this story a lot, in spite of the loose ends. For me, the biggest puzzle is this: why did the creature kill off so many locals? It would make more sense if it went for the pestilential innovators, who are proposing to make it homeless. Something that came in to my mind after re-reading Canon Alberic’s Scrapbook, the creature in the tomb, whatever it is, seems to be of the same ‘kind’ as the creature in Jame’s first story. I also wish that James had mentioned if the inside of the Pulpit was carved in any way, this would have cleared up a lot of questions. It does seem to me more like the folkloric vampire or revenant than the polished modern version. The bad dreams, the communal experience of seemingly random deaths from unnamed sickness (especially of the most frail, as the creature slowly builds up its strength), the dog’s pronounced fear and anxiety, the bestial nature of the thing that escapes. Perhaps the thing was captured and interred within the existing structure of the cathedral, with all its sacred symbols and geometry already in place. If you think of churches as monumental spells, built specifically to both contain the sacred and ward off evil, then imprisoning a powerful entity within one as large and elaborate as a cathedral makes sense. 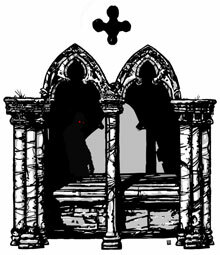 The changing of any element of the structure weakens the containment, the creature begins to exert its influence (certainly in most cultures, vampires or vampire-like creatures can affect the mood, dreams, and even actions of humans around them without moving from their graves), then to manage to break away for short periods to hunt and build up its strength. The opening of the tomb allows the thing to escape, despite not being strong yet, and to flee the area. I like Karen’s remarks above, partly because I don’t like the vampire interpretation. Other than people getting sick, it’s more like the shaggy beasts of other James stories as also mentioned above and those always struck me as being fairly classic demons more than anything else. As for “flitting”, I never thought that implied true flight so I never got the winged creature or shape-shifter thought. I disagree that it ripping the woman’s skirt is sexual in any way too. Somehow I just never get any sexual vibe, overt or repressed, from James’ stuff which is part of why I like it. It’s got an innocence to it and an edge of safety that contemporaries generally didn’t have. I love the relationships between the kids, and Worby and his parents too. Having the father–strong, calm, logical and respected–be the one to get the scare keeps some of the tension that would otherwise dissipate because our narrator saw nothing, as well. If it scared stolid, unimaginative Dad, it must have been hideous. This is actually a favorite story of mine and a lot of it is this different approach. The dialogue is some of his best accent work in my opinion. It has so much color, so even while the plot never gels completely, this is a favorite. Did anyone else notice that the tomb was on the North side of the church, where suicides and witches were buried (externally, anyway)? PS Vulgate is the Catholic Bible, essentially. It was translated out of a 4th century Latin version. This has always been one of my favourite of M. R. James’ stories in that it has a well described location and that there are so many unanswered questions within the main story. A good ghost story should, in my mind, leave some lingering doubt or puzzle at the end. I have been intrigued by what is actually going on with the various events in the story and one idea I read on a short discussion of this story is that we have here two creatures; one imprisoned in the tomb and held there through various arcane devices, and another outside. As soon as the renovation begins, warnings from Dr Ayloff and others obviously hint towards the danger of messing around with the devices that contain the creature. However, whatever is outside the cathedral comes and lurks; waiting, calling, crying. There is a feel of almost palpable emotion and animal aggression in the actions of the thing haunting the cathedral’s environs. I think the significance of the ‘crying’ and the various quotes such as ‘the satyr shall cry to his fellow’ and ‘as if it were calling after someone that wouldn’t come’. Read in this light, and added to whatever caused the noise in the cathedral that distracted the party who were opening the tomb, the story makes more sense. The podcast is excellent and I do like the way you combine a thorough treatise of the text with some nice humour and dialogue. Long may it continue. Thanks.